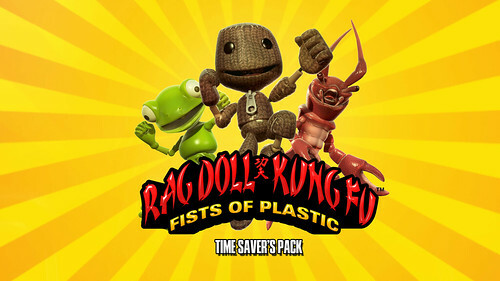 A new pack coming to the PSN Store this week will allow you to instantly unlock Sackboy as a playable character in Rag Doll Kung Fu: Fists of Plastic, an awesome game by our friends at Tarsier Studio. This week sees the release of a Time Savers Pack for the game. This pack immediately unlocks all the extra playable characters and costumes in the game, including Sackboy from LittleBigPlanet and a range of other crazy costumes including a Frog and even a lobster! Sounds like a big ol’ cheat pack for people who don’t have the spare time to put in to get the characters they so desire… genius!